The Indian online tuition market is getting popular among students. The sole reason behind this is the huge price difference between private tuitions at various coaching centres and online tutoring. This is why more and more school, college going students are now getting enrolled for online classes providing them practical insights and individual attention in the comforts of their home at a time convenient to them. If we go by the recent trend, e-tutorial market in India is growing at a compounded annual growth rate (CAGR) of over 40 per cent and is likely to cross Rs 3,500 crore mark by 2015. Many edutech start-ups like WizIq, Meritnation and others have come up to grab this opportunity and utilise its full potential to provide personal learning in most interactive way to youngsters. Sensing the opportunity, four childhood friends – Vamsi Krishna, Pulkit Jain, Saurabh Saxena and Anand Prakash, after graduating from IIT, decided to grab this opportunity and bring a positive change in online tutoring sector and conceptualised Vedantu in 2014. “After graduating from IIT, we started a journey in education as teachers through our first venture – Lakshya, focusing on test-preparation which was later sold off to a listed company. We wanted to do something meaningful together in education space because we shared passion for it. All the work done in the early years germinated into the bigger idea in the form of our second venture – Vedantu. Having ourselves worked in the offline space, we realized the limitations of brick and mortal model,” said Vamsi Krishna, CEO, Vedantu. Vedantu (Veda = Knowledge and Tantu = Network) as the name suggests is the knowledge network, where any student can tap into a teacher directly and learning can happen in a personalized way anytime, anywhere. It’s a live online tutoring platform with an aim to personalize and democratize learning with primary focus on 6th to 10th tuition sector in CBSE and ICSE curriculum. Students also have an option to prepare for competitive exams like NTSE, PSA etc. or simply get their doubts clear anytime, anywhere. They have completely re-imagined one-to-one teaching-learning, and created their in-house WAVE technology (Whiteboard, Audio and Video Environment). This technology consists of a custom built whiteboard, audio and video technology, which makes online learning a pleasure and enables teaching sessions even at a low bandwidth. “Our in-house product WAVE and ‘click to call’ feature are optimised for low and fluctuating bandwidth conditions,” said company’s CEO. 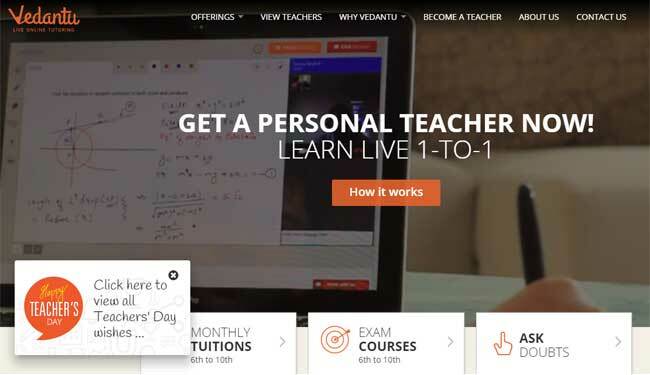 Vedantu being an interactive tutoring platform operates on a teachers’ marketplace model. Any student can select and opt for a live online session/course with a teacher of their choice. Every teacher is listed with an hourly rate, students pay for the minutes they consume and Vedantu takes 25-35 per cent share of the transaction, the rest goes to the teacher. Recently, the firm raised $5 million in its Series A round of funding from Accel Partners and Tiger Global Management. They are using a major part of it towards building a more robust in–house technology and enhancing user experience. In terms of revenue, they are aiming for around 300 per cent growth in the coming years.